Historically, the lectionary consisted of only two readings: an epistle and a Gospel. Adding a third reading, typically from the Old Testament, is a fairly recent innovation. I believe that this is a salutary practice, because too often the Old Testament functions as only a preliminary to the New. Highly typological interpretations, seeing signs and portents in the strangest of places, only highlights this problem. Adding an Old Testament reading to the historic lectionary is highly beneficial for the Church. However, because of this, feasts and festivals tend to add a third reading from the New Testament rather than from the Old. Reformation Day is one such example of this, though there are several which do this, including next week on All Saints. While there is certainly no law mandating one way or the other, one might wish for an Old Testament reading also on those days, if only to emphasize the unity of all of Scripture. Revelation 14:6-7, the “first reading” for Reformation, is actually the traditional epistle reading. The use of Romans 3:19-28, highlighting an important aspect of the Reformation, is more recent, though perhaps more fitting to the occasion. Choosing Revelation 14:6-7 for Reformation is problematic for a number of reasons. First, the selection is entirely too short. 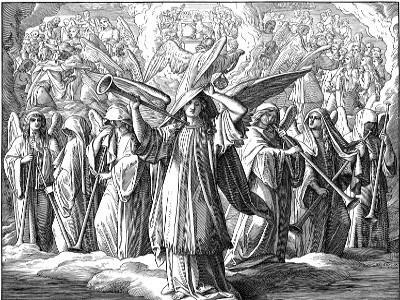 It separates the first angel of Revelation 14 from the other two, and in the process somewhat distorts the intent of the passage. These three angels are harbingers of God’s coming wrath upon the earth. 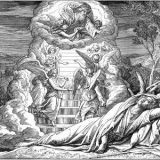 The second angel, for example, follows after the first, crying: “Fallen, fallen is Babylon the great!” The third also follows after and foretells the coming torment of those who worship the beast. Their torment will be unending and they will have no rest day or night. Therefore, while the first angel calls forth a cry to fear God and worship Him, the emphasis falls upon the judgment. Fear God and give Him glory, because He is about to demonstrate His righteousness and holiness in judging the earth. This judgment is indeed a source of joy for His people, as the Psalm declares “Then shall all the trees of the forest sing for joy before the Lord, for He comes, for He comes to judge the earth. He will judge the world in righteousness, and the peoples in His faithfulness” (Psalm 96:12-13). But the message of the three angels is one which should cause the earth to tremble and not to rejoice. “Kiss the Son, lest He be angry, and you perish in the way, for His wrath is quickly kindled. Blessed are all who take refuge in Him” (Psalm 2:12). Second, for this reason, the tenor of the passage is somewhat dischordant with the tenor of the day. The intent of Reformation Day is not an exercise in glory, but a giving thanks for what God has done through the Reformation. As such, it seems appropriate to talk about the distinctive emphases highlighted in the Reformation, such as the nature of grace and the glory of God. Speaking of God’s coming wrath is always important, of course, and it must not be neglected, but commemorations tend to reflect on God’s mighty works in the past as a comfort for the present. His wrath is needed lest we forsake Him who has been so faithful toward us sinners, but we need to recall the things He has done as well. Third, there has been a tendency to interpret this passage as a Biblical reference to Martin Luther. It certainly has a long pedigree, dating back as early as Matthias Hoe von Hoenegg (1580-1645), who in 1612 could not see the first angel as referring to anything other than Luther and the coming of the Reformation (source, in Latin). On the one hand, it is not impossible that the Bible would point to coming historical figures. God is the Lord of History, and all things are in His hand. That is, after all, the point of books like Revelation. It is difficult to see how a passage like Daniel 11:3 could refer to anyone other than Alexander the Great, for example. On the other hand, however, interpreting Revelation 14:6-7 as a reference to Luther seems to rely on this very separation of the first angel from the other two. Hoenegg could see Luther as proclaiming judgment upon Papal darkness, but this interpretation seems too uncertain. What would a passage like this mean for the Christians in the midst of pagan darkness, if it could only refer to the Reformation and to Luther? Would that not also mean treating the book of Revelation as a play-by-play of the End Times? Better, I think, to recognize that the angel proclaims a judgment upon sin which comforts God’s people. Sin and the devil will not triumph. Though you suffer now, God will render judgment upon His enemies. 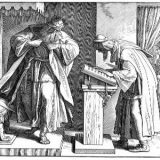 Luther and the Reformation is a historical example of the faithfulness of the holy God, whose victory will be complete. Babylon, with her many faces and many forms, will fall, and the kingdom of our Lord shall be established forever and ever. Amen. In fact, Johannes Bugenhagen already identifies Luther as the first angel of Rev 14 in his sermon over the body of Luther in 1546. This association was probably already known during Luther’s lifetime.